KoopaTV: Alolan Raticate, Type: Null, and MORE Debut in Pokémon Sun and Moon! 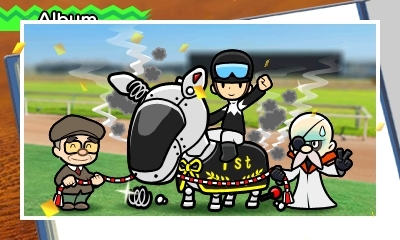 Pocket Card Jockey's robo-type Cyborg horse, invented...erm... bred by Professor Ozimof. There's a Pokémon announced named Jangmo-o, notable for having something that resembles an emoticon in its name. (And for the last three letters being “moo.”) More importantly are Alolan Rattata and Alolan Raticate, new Dark type formes. While Yungoos and Gumshoos are expys of Donald Trump (we endorsed him for president just yesterday, by the way! ), Alolan Rattata and Alolan Raticate are meant to be expys of Ted Cruz. This is strengthened by Ted Cruz's own personal relationships with rats, and that they're both food hoarders. And, of course, their rivalry for electoral turf in real life. Ted Cruz copied Donald Trump's position on building THE WALL. Similarly, Totem Raticate is copying Totem Gumshoos's original defence-rising aura. There are now version differences revealed besides the cover legends, something I've been waiting for. 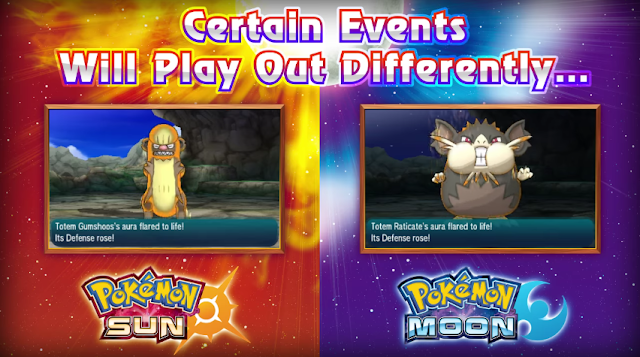 You see above that Totem Gumshoos appears in Pokémon Sun, while Totem Raticate appears in Pokémon Moon. Perhaps you notice that it's daytime in one and nighttime in the other? That's because Pokémon Sun will run by your 3DS's internal clock, while Pokémon Moon while take that clock, and move the time twelve hours later. Reminder that there will be time-specific events in this game. That might SOUND stupid, but I know from reading forums over decades that people actually did want something like this. Or, at least, they were upset that their playing schedule prevents them from experiencing time-specific activities. Since we don't know whether playing at night or the day is, uh, BETTER, it ultimately is a wash-out. Unless you own both versions. Because if playing at night and playing at day are equally desirable and you only have one version, what difference does it make? Moving on to a return to Rotom-related news, which we've been deprived of since the Rotom Pokédex was announced. The Photo Finder mode is basically Pokémon Snap, but without rails. So it's just sitting in one place (there are specially-designated spots in the overworld for this) watching an animation and going for the best picture. You get scored. Your camera is your Rotom Pokédex, and Rotom talks to you during the whole process! Cutely. You level up your camera capabilities (aka Rotom) the more you play! 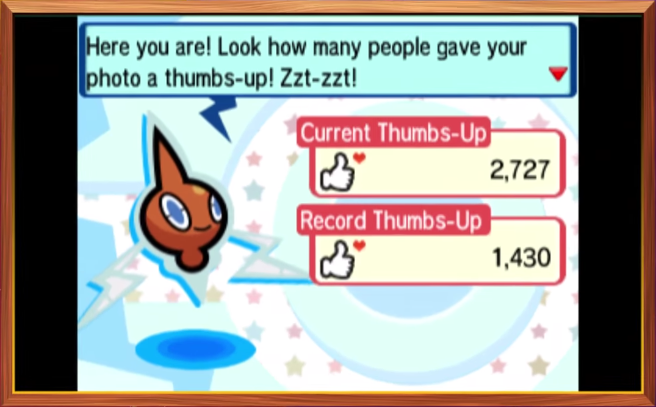 I want the best Rotom, so I'll be playing this Photo Finder mode even if it's lame. Finally, there is the Aether Foundation. These are basically humanitarians trying to shelter Pokémon on their artificial island paradise. Goodie-goodies. They actually do dedicate their time and money to actually helping people and Pokémon, rather than lining their own pockets. Not every charitable foundation does that, you know. 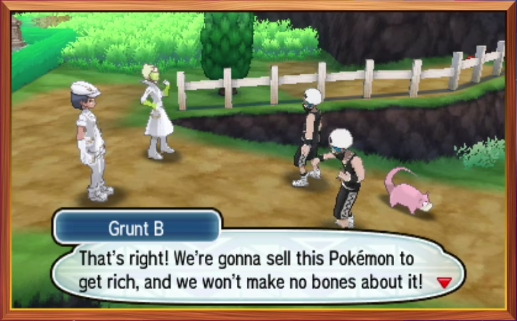 Grunt B's hand-motions get ridiculous here, but basically Team Skull is taking inspiration from Team Rocket's Slowpoke schemes. There's also some random Zygarde-collecting stuff I don't care about, featuring returning characters from Pokémon X and Pokémon Y I don't even remember. 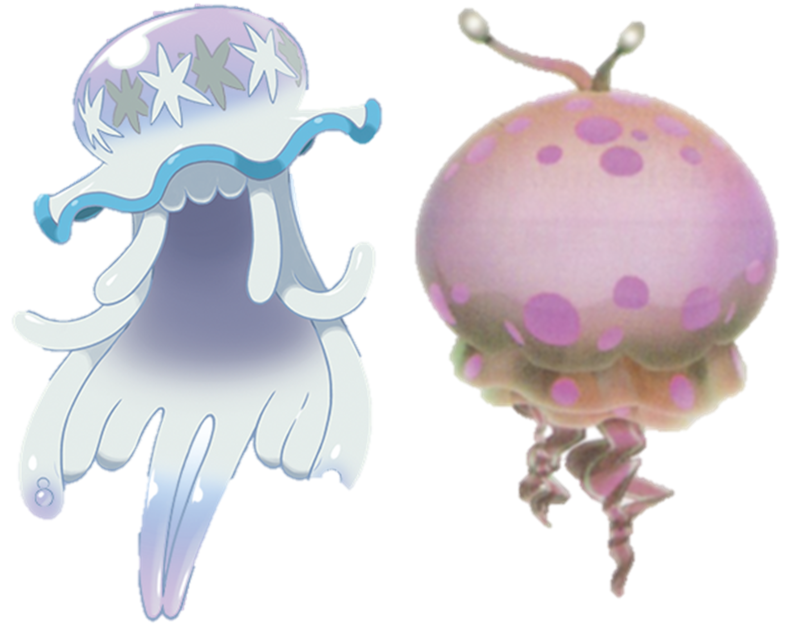 Okay, so there is this scary floating jellyfish thing known as UB-01 and it's not even a Pokémon. There are other Ultra Beasts and they have different numbering. What are they and where do they come from? No idea, which makes them illegal aliens that Alola needs to defend itself against. These will play some substantial role in the story. UB-01 is basically a Pikmin 2 Greater Spotted Jellyfloat. Ludwig is still going to get Pokémon Moon, since he has no idea if the time-changing thing is actually relevant. He's a little concerned that Gumshoos might be a Sun-version exclusive, but that's far from confirmed. What speculation do YOU have about the new Pokémon Sun and Pokémon Moon news? Let KoopaTV know in the comments section, of course! More Ultra Beasts and version exclusives in the next news announcement! 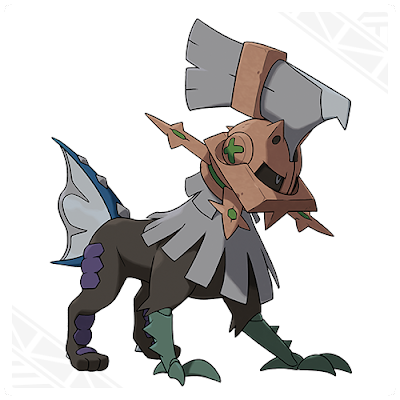 Type: Null actually evolves into something even more powerful, and unmistakably resembling a very important Mythical Pokémon. Ludwig later named a horse Type: Null in Pocket Card Jockey. I'm getting more excited for Sun & Moon with all these revelations. I like Gladio, I love the idea of the Ultra Beasts, and I want to learn more about the Aether Foundation because they seem secretly shady to me. 1. Because it's such a common twist for video games to have a "good" organization that is secretly evil. 3. "I will be a mother to all of those poor Pokémon and shower them with love"? They're so over-the-top GOOD, it makes it even more likely they're secretly bad. 4. Faba really looks evil. He's one cackle away from being a mad scientist. 5. Plus they even have "employees" presented just like grunts from other evil teams. 6. Finally... I just want it to be true because they look like they'd be such fantastic villains, pretending to be good guys and messing around with science and everything! It would be so exciting! I'm hyped!!! 1. It's not really a thing for Pokémon. 2. The Aether Foundation is researching the Ultra Beasts. Doesn't mean they're responsible for their outbreak. 3. You're so cynical and doubtful! 4. He is pretty suspicious, but that should take away from point #3, not reinforce it. 5. It's called being fair & balanced! 6. I'm not a fan of their outfits. 1. Yeah, but the series has also only recently started to move into more interesting plots, too. 2. SCIENCE! Ahem. I know. I'm just saying, we have some sinister science-y stuff as well as an organization of science-y people. 3. I know, but either that character is so sweet it's cringe-worthy, or she's evil. 4. He still pretends to be good and nice. An evil organization pretending to be good can have people who look good and those who look evil! But I'll settle for Faba being an evil guy manipulating the well-meaning Aether Foundation. 6. I don't care much for their outfits either, but I still like them as potential villains. 2. Can't scientists be good people? ...Eh, what am I saying? Of course they can't. 3. Cringe-worthy sweet characters ARE an archetype. 6. I'd want to know more about them. Not everyone with a private artificial island is evil. Just most people. Well... there definitely wasn't much of an emphasis on... science.